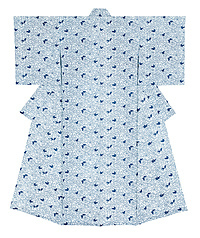 In Edo komon, minute, delicate designs are applied to silk, but the technique of nagaita chugata involves making larger designs on cotton yukata (an informal summer kimono) using a board about 6.5 meters long (the word nagaita means long board, and chugata means medium-sized pattern). 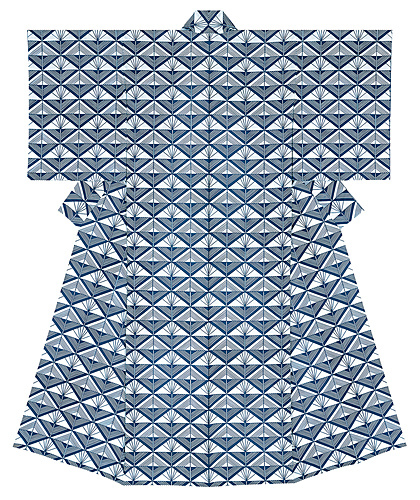 Nagaita chugata is a traditional Japanese technique in which paste is applied to both sides of a white cloth, and then both sides are dyed with a crisp indigo pattern. (4) Wash the reddish paste out in water, and the indigo pattern appears. It's done!